AKIPRESS.COM - Residents in Guiyang city, south-west China, thought they were imagining things when they saw a massive waterfall cascading out of a high-rise building in the middle of the street. 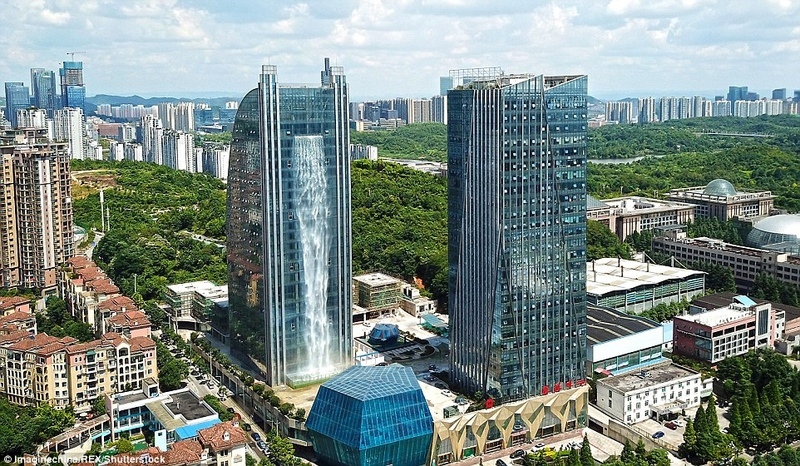 In fact, the 108-metre-tall (350ft) fall is indeed a part of the towering Liebian Building, located at a public plaza in the city's central business district. A large tank is installed at the foot of the 121-meter-tall (397ft) skyscraper, where four 185-kilowatt pumps would lift the water to the top of the fall. The waterfall is managed by Guizhou Ludiya Property Management Co. and is designed to be a tourist attraction. The waterfall is set to run for only about 10 to 20 minutes to save electricity.